Chiswick property prices risen back towards record levels last seen at the end of 2007 according to the latest official figures. 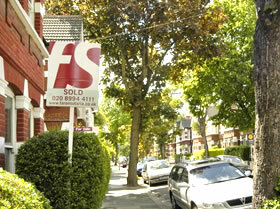 The average sale price in the first quarter of 2010 was £622,723. The highest ever quarterly average was just over £635,000 in the fourth quarter of 2007. Prices have risen by 7.3% compared with the same period last year but the number that will be giving local estate agents the most pleasure is the 216% rise in the number of transactions. The rise looks to be more broad based than earlier in the recovery which was driven by strong volume at the top end of the market. This time it is terraced houses and flats that are seeing the biggest moves up by 29.0% compared with last year. Flats have seen the fastest growth in volume which arguably means that the increase in the overall average is understating the true strength of the market in the early part of this year. London has been the best performing region of the country over the last twelve months to the end of March with the average price in the capital rising by 13% to £336,409. The rest of the country has seen rises of 7.5% bringing the national average to £164,288 although prices did fall slightly during March. Right Move's House Price index, which is based on offered prices rather than sales prices, is showing that in April sellers ignored pre-election concerns and put prices up by 2.6% in the month. In London the average asking price is now £421,822. Miles Shipside, commercial director of Rightmove said, “Rarer property types in desirable locations are achieving record prices. For ‘location, location, location’ you can also read ‘cash, cash, cash’. Conversely, in areas where buyers have less access to cash or mortgage finance, or there is an over-supply of a certain property type, then sellers are having to price much more aggressively to secure a sale. There is increasing divergence between these different markets, with agents reporting some pockets where a couple of viewings find a cash-rich buyer, whereas a few miles down the road it’s taking over 20 viewings to achieve a sale”. Although political uncertainty appears to have had little impact on property in the UK thus far he expects the market to go into 'suspended animation' until a clearer picture emerges on the stability of the new Government.